About a month ago, Youtube user gearfreezone (assumed to be associated with Fallbrook Technologies, makers of the Nuvinvi hub) posted 9 instructional videos for the NuVinci 360 which is a continuously variable transmission hub. 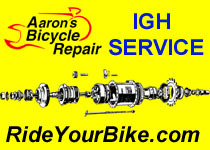 They cover wheel building, sprocket installation, and shifter installation to name a few. I’ve embedded all of the videos at the Hubstripping page about the NuVinci 360 for quick reference. Thanks! This is especially useful because when I go to the YouTube site, some lists of the video only show the main title, “Technical Video X” without showing the text describing what the video shows (like “Wheel building”), so your list is very helpful. (I’ve got an N360, but haven’t built it into a wheel yet). Now they made a liar of my by renaming their videos to give them more descriptive titles, which was nice of them. This is exactly what i was looking for 🙂 tks gona try this later and see how it goes, cheers !